Amidst my Christmas holiday week of movie watching (American Hustle, Casablanca, City Island, and Frozen a second time), I managed to find the time to finally sit down and view The Sound of Music Live! I have since been debating whether or not to post about it. I feel like everyone and their mother have already put their two cents in, particularly in the theatre community, and it was quite the mix of feelings. It seemed like this musical broadcast became either a personal affront to viewers or a personal accomplishment. There was a lot of hate and a lot of preaching back to that hate. My Facebook news feed blew up the way it does when there’s a big football game on, and I end up having no idea what anyone’s status means. But I figure things have died down a bit, and I suppose it can’t hurt to throw a couple more pennies into the mix, right? Let’s start with the good, shall we? There was some lovely singing, smooth camera work, and solid nun talent. Vampire Bill – I mean, Stephen Moyer? He did a pretty decent job! That kid playing Kurt? Great. He was in it. Audra? Clearly. Do we even need to talk about her? Everyone already knows she’s a goddess. It was a pleasure to have real theatre folks involved like Christian Borle as Max. There’s an extra comfort level in watching stage actors do what they do best, especially those who already have TV experience. But let’s be serious, I’m mostly writing this review so I can brag about Laura Benanti. I love her, love her, love her, and I’m so glad people are finally starting to take notice of her abilities. I was never drawn to Elsa growing up. I didn’t understand the character, but now she’s clear to me. Laura brings a naturalism to the role, to live filming, to song, to everything. And thank god we had her for some laughs. Of course there were weak links, but I honestly don’t want to dig into them too much. I don’t know what was up with the costumes. Some of the kids were hard to watch. The mountain set was awkward, although the scene changes were smooth and well done. Listen, I know you’re all waiting for me to rip into Carrie, but I don’t really want to do that. The critics have been cruel enough. I’ll just say this: I feel bad that she and the people who represent her thought this was a good idea. She’s talented and clearly can sing, but she is simply not an actress. This doesn’t make her untalented; it just makes her not an actress. There isn’t an acting instinct in her bones. I was frankly very uncomfortable watching her speak any dialogue. I also feel bad that they yanked all of the “Southerness” out of her. This at least gives her character and flavor. True, Maria shouldn’t be a Southern belle, but without it, she came across as vanilla and bland. I understand that Carrie was cast to draw in viewers. Hopefully next time they’ll find a name that can better carry a show. All that said I’m thrilled they took on this endeavor. It’s a wonderful chance for people who don’t live in a big theatre city to get to see a musical on screen. To this day, musicals still don’t get a lot of respect. People consider them merely fluffy or lame; they’re all flash and spectacle and couldn’t possibly affect audiences the way plays can. 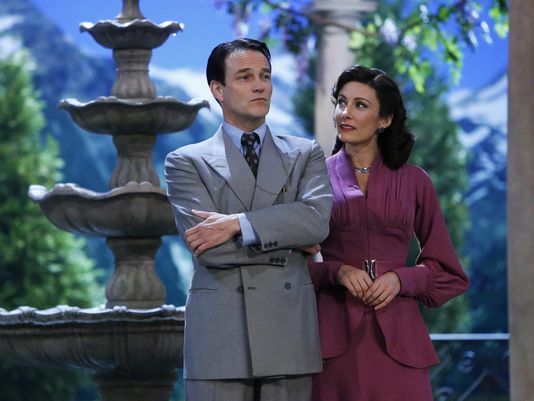 The fact that NBC is going to do another live musical due to the ratings The Sound of Music got is fantastic as far as I’m concerned. Folks associating musical theatre with high ratings? I don’t know about you, but as a musical theatre fan through and through, I’ll take that any day. You’re right; Audra McDonald elevates anything she’s in. I did, however, point out to Meredith that there would not have been any dark-skinned nuns in Austria in 1938! She looked ridiculously out of place even with her magnificent voice and beautiful countenance. My assessment: a novel idea which needs a lot of tweaking. Thanks for commenting, Liz 🙂 And for reading!